The tune, The High Road to Linton is also known as An Bóthar Mór go Linton, Highway to Linton, Kitty Got a Clinking, Cuddle in a Boasie, and The Leinster Highroad. There are several towns/villages named Linton in Scotland. East Linton is a town in East Lothian, situated on the River Tyne. West Linton is a village and civil parish in southern Scotland. 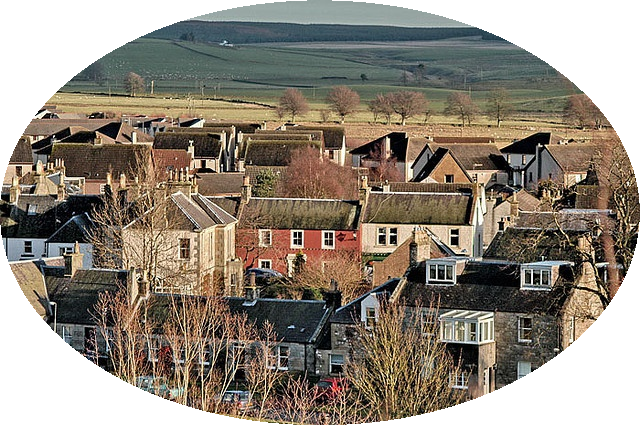 Linton is also a small village in the Borders area of Scotland situated a mile north of the village of Morebattle. The tune is probably associated with West Linton and the “high road” of the title may refer to an old drove road, also known as “The Thieves Road” so called because Border Reivers, Moss Troopers (brigands who operated in Scotland during and after the period of the English Commonwealth in the mid-17th century) and robbers galloped through the pass on night raids. Drovers enroute for the market in Falkirk slept beside their herds and flocks, determined to defend them with dirk and staff, but the cattle and sheep were often driven off and bloodshed was common. It was a Border Country custom to plunder and thieve cattle, known as reiving (a historical name for robbing), and commonplace amongst the major Borders families. In these lawless and battle-strewn times, it became the practice of the day for the local lord to appoint a leading townsperson, who would then ride the clan's boundaries, or "marches", to protect their common lands and prevent encroachment by neighboring landlords and their peoples. Common Riding is an annual event celebrated in Scottish Border towns and in some other places, to commemorate the times of the past when local men risked their lives in order to protect their town and people. Common Ridings in West Linton led by the Whipman, the old Scots word for carter or carrier. In 1803 after the annual meeting of the Whipmen Benevolent Society, the committee paid formal visits to local mansions. The rest of the day, one of the few holidays of the year at the time, was devoted to sporting activities, a gathering which was styled “The Whipman Play”. The ceremony has continued since, unbroken except by two wars, revived in 1949. The Linton Whipman is installed and invested with his sash of office on the Friday evening, and leads a mounted procession through the village. Saturday begins with a ride out and there follows a week long program of activities of sports, competitions, barbecue and bonfire.